Designed to resist concentrated acids and bases, the Ansell AlphaTec 85-302 CSM Medium-Weight Isolator Box Gauntlets are long-lasting and mechanically strong gauntlets. Their polyethylene coating and smooth design provide exceptional grip, while their medium port size of 250mm is designed to fit most isolator glove boxes. The AlphaTec Gauntlets have been tested against EN standard EN 374, and are certified for use with chemicals and microorganisms. They have a permeation resistance of at least 30 minutes when tested against EN 374 - 1, with the following chemicals. 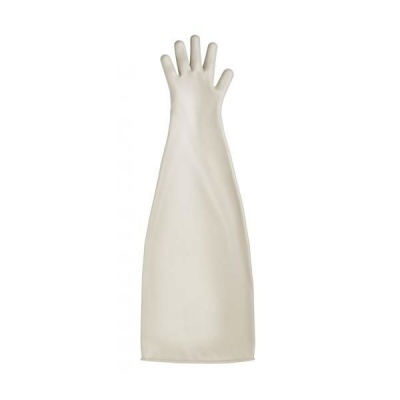 The Ansell 85-302 Medium-Weight Gauntlets are available in two sizes that should suit the hands of most users. Please measure the circumference of your hand around the knuckles (excluding the thumb) with your hand open and your fingers together, and the length of your hand from the tip of your middle finger to your wrist. Please note that these gloves are made to order, and therefore have a three-month lead time on average.